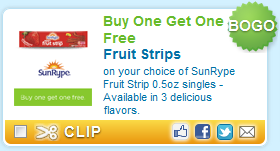 Buy One Get One Free Fruit Strips on your choice of SunRype Fruit Strip 0.5oz singles. Look under Foods, second page. Print two!